These Candy Apples, from Tudor, a leading manufacturer of school recorders throughout the country, are 2 piece transparent soprano recorders that not only provide eye-candy, but sound great too! Each recorder includes a bag. The Do It! 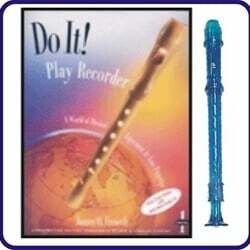 Play Recorder method, by three of the best educators in the field today, contains everything you need to teach and play the recorder. Song repertoire includes music of various styles, time periods, and countries. The book includes a music dictionary. The individualized format allows students to progress at their own paces.